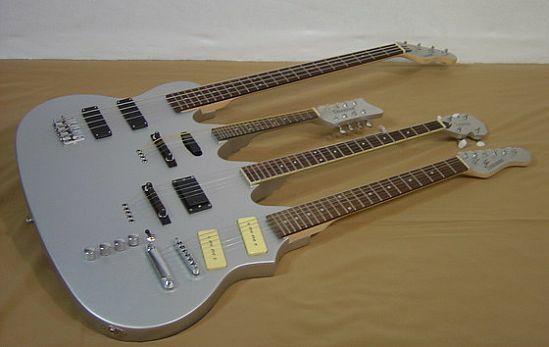 I can barely find my way around a regular guitar so I cannot even imagine risking an arm or two trying to lug around this mammoth 4-in-one string instrument combo. But I guess it could be a real boon for people who actually know the difference between a guitar and a mandolin. 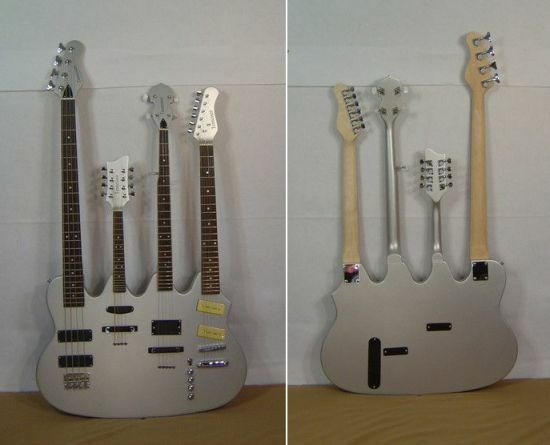 The first neck on this quad futures a string bass neck with 22 frets on rose wood fret board with smooth maple neck with two full size bass pickups and chrome Tennessee brand tuning gears. The second neck is the mandolin neck and features 8 strings with 20 frets with 1 single coil mandolin pickup along with chrome tuning gears and fully adjustable rose wood bridge. 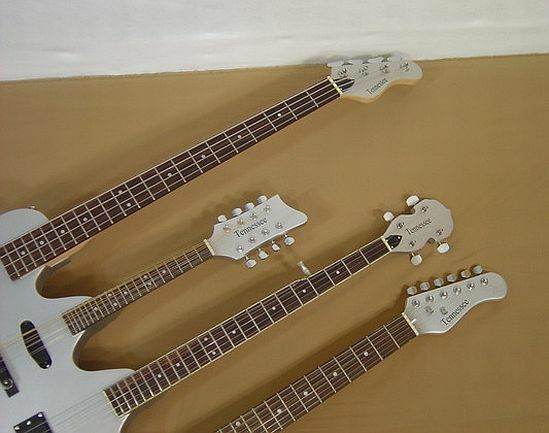 The next is the banjo neck which features 5 string and 22 frets along with ivory color tuning gears. Th last neck is the 6 string guitar neck with 22 frets, with two full size P-90 guitar pickups and chrome tennessee brand tuning gears as well as solid tune position markers on the side of the neck chrome bridge and tailpiece-trus rod. 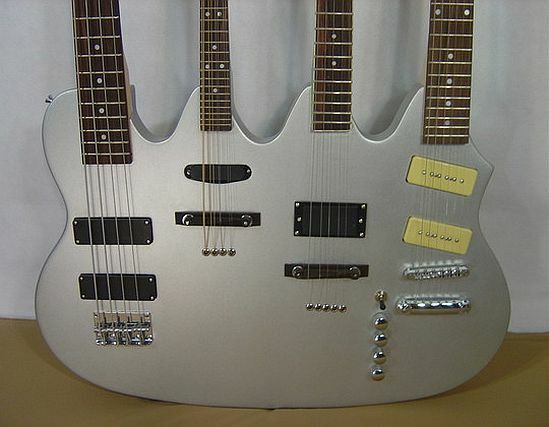 Over all controls on this sucker include 1 chrome volume know, 3 chrome tone knobs and a 3-way switch. The gorgeous quadruple neck instrument comes with a high gloss silver sparkly finish which makes it just the ideal all-in-one tool for the average to advance level musicians.